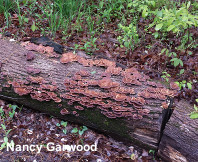 Panus neostrigosus is easily recognized by its habitat on the recently dead wood of hardwoods, its densely hairy cap, its white mature gills, and its frequently off-center stem. The color of the cap varies from purple to pinkish brown, orangish brown, or tan—but the hairiness does not vary. The stem is sometimes nearly absent, leading to potential confusion with faded specimens of Phyllotopsis nidulans, but the latter has orange gills that usually manage to resist fading even when the cap is no longer bright orange. 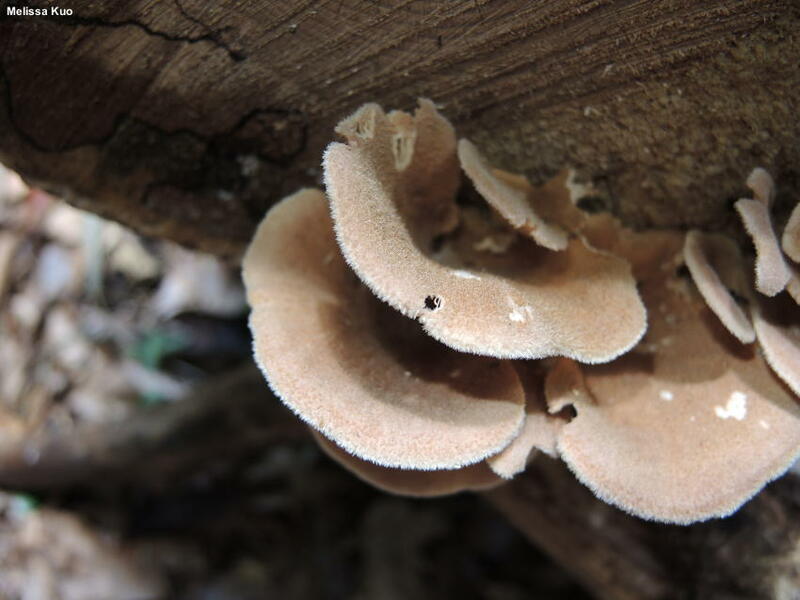 Like Lenzites betulina, Panus neostrigosus is a polypore with gills, challenging the traditional definition of what constitutes a "polypore"; see the essay on the Lenzites betulina page if you are interested. 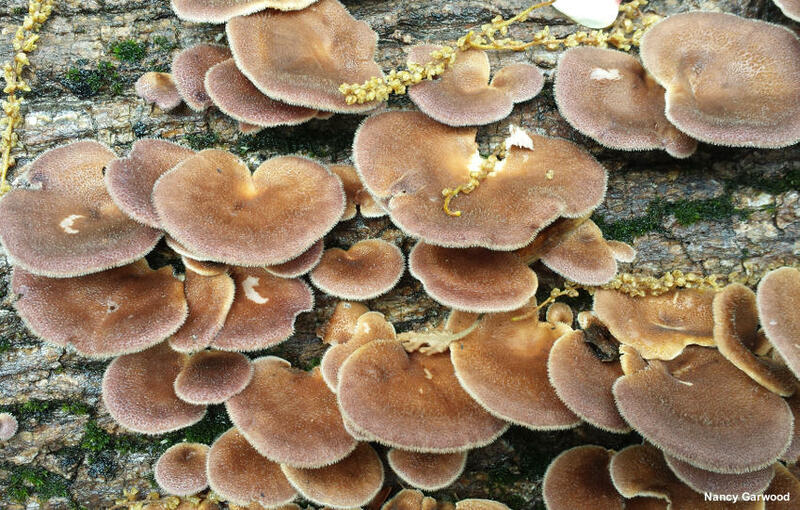 Contemporary DNA-based studies have consistently placed Panus among the polypores, and a recent organization of the polypores by Justo and collaborators (2017) erects a new polypore family, the Panaceae, to hold the genus. 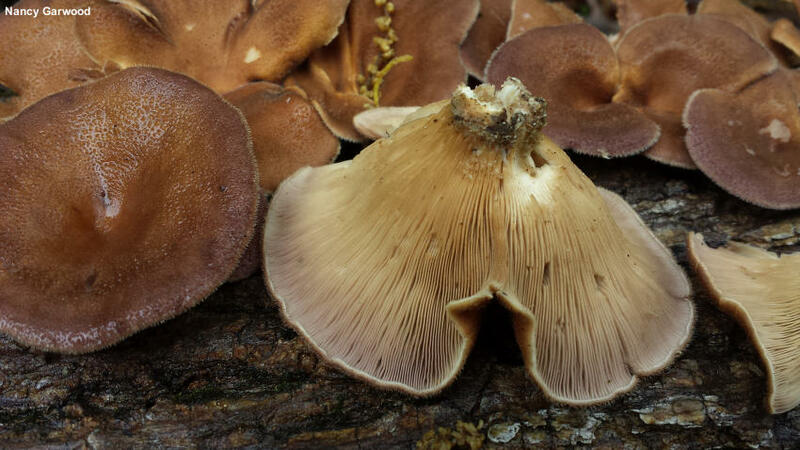 Synonyms for this mushroom are many. It has been known as Panus rudis and Lentinus rudis—but Pegler (1983) synonymized these names with Panus/Lentinus strigosus. The species epithet strigosus, originally used by Fries (1825) has been problematic because of competition from an entirely different "Panus strigosus," named by Berkeley & Curtis (1859), now generally known as Pleurotus levis. To clear up the confusion Drechsler-Santos and collaborators (2012) provided a new species name for the mushroom described and illustrated here: neostrigosus. Thanks to Nancy Garwood for collecting, documenting, and preserving Panus neostrigosus for study; her collection is deposited in The Herbarium of Michael Kuo. 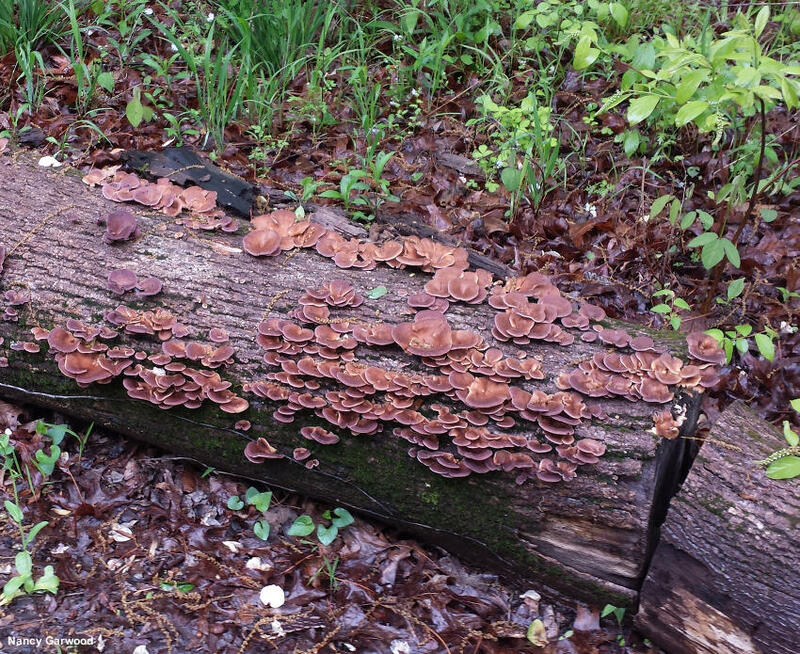 Ecology: Saprobic on the wood of recently dead hardwoods; growing alone, gregariously, or in clusters; spring through fall (also over winter in warm climates); widely distributed in North America. The illustrated and described collections are from Illinois, Ohio, and Colorado. Cap: 2–6 cm wide; convex with a tightly inrolled margin at first, becoming depressed or vase-shaped with an even margin; round in outline or tongue-shaped to irregular; densely hairy with hairs 1–2 mm long; dry; often purple at first, but soon fading to reddish brown, pinkish brown, orangish brown, or tan. 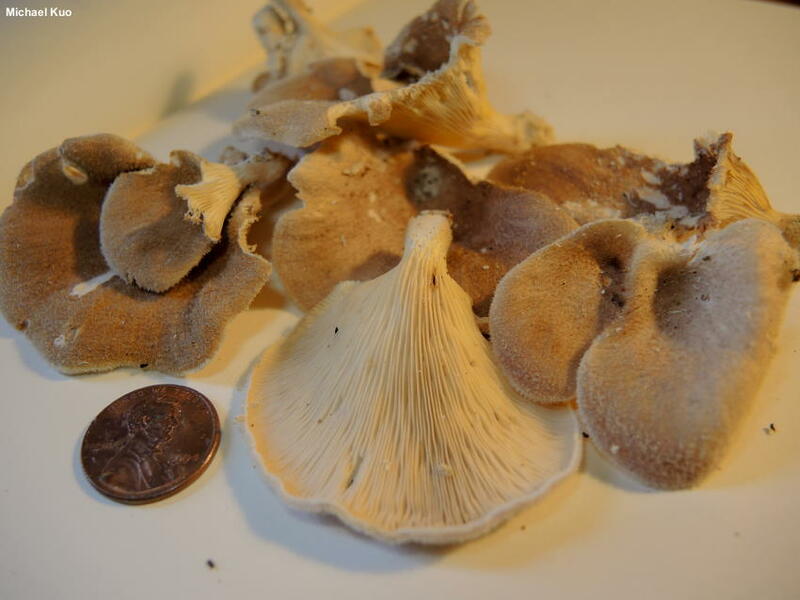 Gills: Running down the stem; close or crowded; short-gills frequent; sometimes purplish when fresh and young, but soon white; eventually pale brownish. 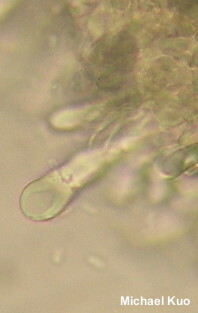 Stem: 1–2 cm long; up to 1 cm wide; often off-center or lateral; equal above a slightly swollen base; tough; dry; densely hairy; colored like the cap or paler. Flesh: Whitish; unchanging when sliced; rather tough and stringy. Odor and Taste: Odor not distinctive; taste not distinctive, or sometimes bitter. 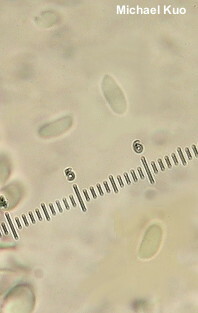 Microscopic Features: Spores 4–5.5 x 1.5–2 µm; cylindric to long-ellipsoid; smooth; hyaline in KOH; inamyloid. Cheilo- and pleurocystidia 25–65 x 5–15 µm; cylindric, subclavate, or subutriform; smooth; developing very thick walls; hyaline in KOH. 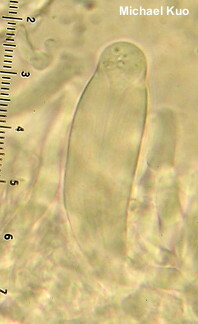 Basidia 20–25 x 3–4 µm; subclavate; 4-sterigmate. Pileipellis brown to golden brown in KOH; a poorly defined, partially gelatinized layer from which arise aggregations of erect elements 2.5–5 µm wide, clamped at septa, golden-walled and smooth; terminal cells cylindric with rounded, subacute, or subcapitate apices. REFERENCES: Drechsler-Santos & Wartchow, 2012. (Fries, 1838; Saccardo, 1887; Kauffman, 1918; Smith, Smith & Weber, 1979; Pegler, 1983; Weber & Smith, 1985; Arora, 1986; Lincoff, 1992; Metzler & Metzler, 1992; Roody, 2003; McNeil, 2006; Miller & Miller, 2006; Drechsler-Santos et al., 2012; Justo et al., 2017.) Herb. Kuo 07280604, 07151607, 04211701.